According to Diamond Comics, Archie's Sonic The Hedgehog #170 went on sale in comic shops either yesterday or today depending on shipment arrivals. I was on GameFAQS, and someone found what appears to be screenshots of 2 mini-games. One that shows Sonic, Knux, Amy, and what looks like the genie in a fiddle contest, and another that show the characters in front of balloons doing something. Also, apparently this game has already been rated E, which seems like it got rated awfully fast compared to Shadow, Riders, Rivals, and StH. The game come out in March 15 in Japan and it uses an physic engine call the AGEIA engine. Sonic The Poster Mag 2006 - out now! Just in time for your Christmas stocking, it's the new Sonic the Poster Mag - containing posters, behind-the-scenes features, a seven-page Sonic strip, and the Freedom Figher's horrible singing! According to Diamond Comics, Archie's Sonic The Hedgehog Archives Vol #2 went on sale in comic shops today. Volume #2 is a reprint of Sonic The Hedgehog #5-8 (digest size). Deleted/Extended Sequences for Drood Henge and The Doomsday Project. These sequences were never produced. I've found and animated the storyboards and bookended them with the scenes that would have come directly before and after to give you an idea of where they would have gone within the story. Also, if you go to FUS, you can see the cover for the box set. So apparently the PS3 version has been delay till January 30. According to Diamond Comics, Archie's Sonic X #15 went on sale in comic shops today. 8. Packaging Designed COMPLETELY by The Fans! "Rouge Goes Rogue! ": Can it be true? Has Rouge the Bat really returned to a life of crime? After being accused of stealing a moon emerald, Rouge goes to Knuckles seeking refugeÃ¢â‚¬Â¦ but can Knuckles trust that she's telling the truth, especially with the Master Emerald to protect? And with so many questions in the air, how should Sonic and Agent Topaz react? It's the twisty-est, turny-est Sonic X saga yet! SCRIPT: Joe Edkin. ART: David Hutchison (pencils) and Terry Austin (inks). Maximum security cover by Spaz! "Round Up!" Wait until you see who just got engaged! But don't celebrate just yet... there's trouble afoot, and now the engagement party has become a seek and capture party for the Freedom Fighters! Along the way, old foes will return, fractured friendship will be restored, and both new alliancesÃ¢â‚¬Â¦ and new rivalries will form! All this, plus a virtual "who's who" of characters from Sonic's epic mythology! SCRIPT: Ian Flynn. ART: Tracy Yardley (pencils) and Jim Amash (inks). Hail, hail the gang's all here cover by Tracy Yardley and Jim Amash. According to Diamond Comics, Archie's Sonic The Hedgehog #169 is on sale in comic shops today. Sonic Rivals was released for the PSP earlier this week. You can read a review of the game at IGN. Sonic for the next generation is available the pc. You can order it on amazon uk for Ã‚Â£16.99. After years of delays and restarts, Project Chaos: A Sonic 3 & Knuckles Arrangement Album has been released at OverClocked ReMix. 35 tracks covering the Genesis classic span across three discs in this collection. Download the album for free at the project's webpage. According to Diamond Comics, Archie's Sonic The Hedgehog Archives #1 goes on sale in comic shops today. It is a reprint of Sonic #1-4 (regular series; not the mini-series) in a digest format. For the few of you who care, in February we'll see "season 6" [episodes #66-78]of Sonic X on DVD, effectively completing the series. If you have an X-Box 360, Sonic The Hedgehog is in stores in North America now--so go buy/rent and play. You can read the press release at Gamespot. You have another month to wait if you want it on Playstation 3. According to Diamond Comics, Archie's Sonic X #14 is on sale in comic shops today. Playing catch up, but Archie Previews encompassing Sonic X #14-17, Sonic The Hedgehog #169-172, and the Sonic Archives #1-2 can be seen here. At Gamespot's official Sonic Rivals page, you'll find screenshots of Metal Sonic as a playable character alongside Sonic, Knuckles, Shadow and Silver. Sonic the hedgehog nextgen official site for North America is open. Customise and personalise Sonic's special abilities by spending the rings you've collected on custom moves! After a slight delay, STC-Online #240 is finally out! Sonic in a race against time to prevent a bombing in Casino Night Zone! Tails & Amy face the machinations of the sinister Insect Family crime syndicate! But there may be a bigger threat lurking in the wings... Robotnik?! But he's insane... isn't he? According to EBGames.com, Sonic and the Secret Rings will be released on March 6th, 2007. Also, it seems that if you reserve Sonic the Hedgehog for the 360/PS3 at EBGames, you get a free Sonic plushie. That last bit may not be news, per say, but it's still kinda cool. Sonic SatAM to FINALLY get DVD Boxset! As many of you may have heard by now, DiC Entertainment and Shout! Factory will be releasing all 26 episodes of the Sonic SatAM in a DVD Boxset sometime in early 2007. Source to this news can be found here. Even though I may be editorializing here, I'd be safe to say this has been too long in coming. Sonic Riders is apparently being released on the PC. Why the PC? I don't know. Miss Sonic X in the UK? A lot of Sonic X fans in the UK might have noticed that Sonic X has disappeared from the Jetix schedules over the last few weeks in place of Power Rangers Generations, some are hinting that it may have been dropped by the channel altogether following this. It is confirmed that this won't be forever, the show will be returning to Jetix in September, the return date or timeslot has not been given at the moment. So watch this space! According to Diamond Comics, Archie's Sonic The Hedgehog #165 is on sale in comic shops today. In 1993, Sonic the Hedgehog sped his way from video games to comic books. Almost 200 issues later, "the blue blur" can lay claim to having the most successful comic book career of all video game heroes! Now you can travel back in time to where it all began in SONIC THE HEDGEHOG ARCHIVES, a thrilling series of upscale reprints that lets you revisit SonicÃ¢â‚¬â„¢s early days in a premium yet affordable format. These special 5 x 7 & Ã‚Â½ inch editions contain 112 action-packed pages, faithfully re-colored and printed on superior stock, with a low cover price of only $7.49 US! Picking up where the SONIC THE HEDGEHOG: THE BEGINNING trade paperback left off (which reprinted the original Sonic mini-series issues #0 through #3), SONIC THE HEDGEHOG ARCHIVES #1 ships in November and dives right into the action, starting with the first issue of SonicÃ¢â‚¬â„¢s ongoing comic book series all the way up through issue #4. Following on its heels in December is SONIC THE HEDGEHOG ARCHIVES #2, representing issues #5 through #8. According to Diamond Comics, Archie's Sonic X #11 is on sale in comic shops today. "Hare 'em, Scare 'em": Just in time for Halloween, this issue is full of tricks but not many treats for our heroes. After his best friend Tails is tricked and blamed for unleashing the devastating power of an alien space craft upon Station Square city, Sonic races to his aid, but both of them end up apprehended by a shadowy government agency. Trapped in jail alongside the villainous Dr. Eggman, our heroes remain helpless as the spookiest ghosts of all time, King Boom Boo and his creepy cohorts, threaten their friends' peaceful existence! Can they bust out. and bust the ghosts. before it's too late? Featuring action-packed manga art from fan favorite David Hutchison (Antarctic Press's "Wizard of Oz")! SCRIPT: Joe Edkin. ART: David Hutchison. CREEPY-COOL COVER BY SPAZ! "Order From Chaos: The Gathering Part 1 of 2": A new and deadly evil lurks in the darkness, prepared to strike Sonic and destroy the entire planet. This latest menace proves to be one of Sonic's deadliest villains ever, and this time we might just mean it when we say the combined forces of Sonic and the Freedom Fighters may be no match for this fiend! Especially since Sonic may have to put a friend or two's life in danger just to stop him! PLUS: With Antoine and Bunnie finally back together and love in full bloom again what can Sonic have to say that could put this relationship in jeopardy? Find out in this intriguing back-up tale. SCRIPT: Ian Flynn. INTERIOR ART & COVER: Tracy Yardley. According to Diamond Comics, Archie's Sonic The Hedgehog #164 is on sale in comic shops today. Sonic is officially a launch title for the PS3 (for those who can afford it).The 360 version comes out the same day too. It's pretty well done. Sonic satam and Underground mentioned, but suprisingly, not Sonic X. Sonic extreme is also discussed. Wizard conducted an an interview with Ian Flynn at Heroes Con. Click the link to read it. James Fry on 'Nuff Said! The next episode of the radio program 'Nuff Said! is this coming Tuesday overnight, July 4, 3:30 AM to 6:00 AM eastern time. Technically, it's Wednesday morning the 5th. My guest is James Fry, who has been pencilling for about 20 years. His pencils have appeared on Moon Knight, Shadowhawk (Image), Sonic the Hedgehog, X-Factor, Mutant X, Batman Adventures and Star Trek. His next project is Darkman Vs. the Army of Darkness. Sonic Channel had a character contest/survey on their site that was previously reported. Thanks to Lizard and big smile at The GHZ, the results are now available. "Attack from Area 99!" With evil Eggman behind bars, Sonic finds himself a man without a mission. Even his best friend Tails is otherwise occupied. and big time! Tails has been called in by the government to reverse-engineer the alien technology in the tripod from Sonic X #7. However, Agent Westwood, aka Cowboy has other plans for this super-powered, alien war machine. Hmmm. sounds like Sonic could be on another mission soon enough! SCRIPT: Joe Edkin. ART: Tim Smith 3rd. Atom-smashing cover by artiste 'de bomb Spaz! According to Diamond Comics, Archie's Sonic X #10 is on sale in comic shops as of yesterday. You can see a 3-page preview of the issue at Silver Bullet Comics. The Game Boy Advance has played host to a Megadrive classic of Sonic's before, with the inclusion of Sonic Spinball in SEGA Smashpack. IGN has now announced a new release though, in the form of the very first Sonic The Hedgehog, remastered. According to EB Games, Sonic Rivals for the PSP will be released on November 21st. There's still no word on Sonic Wild Fire however, but I'll post as soon as I know. According to Diamond Comics, Archie's Sonic The Hedgehog #163 is on sale in comic shops since Wednesday. The official release date for Sonic the Hedgehog for the XBox360 is November 14th, 2006. Thanks to FARGAIA at Sonicanime.net. He has found a article concerning a new projected dealing with new SonicX eps at the TMS site here at http://www.tms-e.co.jp/index2.html since the site is in Japanese and most can't understand it here is a translation that FARGAIA did on the site. TOMS entertainment had held a session of new audit for consumer and business person on May 30. The most important matter is that TOMS cooperates with SEGA SAMMY HOLDINGS and SEGA TOYS, and is planning to throw 4 new animations into market. And, the 4th animation is untitled. 'Oshare-majyo Love & Berry' is so popular Arcade game in Japan. Especially, this game has strong popularity between teen kids. This card version had already gotten over 104,000,000 pieces. This is just marvelous. 'SonicX' is Animation series of Sonic The Hedgehog which has world-wide scale popularity and makes a boost of 40 million total sales all over the world. And 'Bakumaru' is cartoon series of new gene toy such as BayBlade. Now 'Bakumaru' begins to catch teen kids heart and lead the latest trend. This animation plan is very effective for multimedia development of each work and we can expect synergy with the game series. Some companies including SEGA have strong expectation for this media strategy. Therefore TOMS has so big responsibility and must accomplish this important mission." According to Diamond Comics, Archie's Sonic X #9 is on sale in comic shops starting today. Also, Sonic Super Specials #6-8 are being sold again if your comic shop ordered them. Good news to UK Sonic X fans! I checked the Sky website and Sonic X is now back on at weekends at 2PM! This could probably mean the rest of season 3 will be showing! It's a brand new era of STC-O and the perfect jump-on point for new readers, with the start of three new strips and the introduction of a brand new menace for Sonic & the gang! Sonic may say he's the hero of Mobius, but what do we really know about him? Discover the sordid and shocking truth in The Inside Story! Meanwhile, Amy Rose stars in the world's only hybrid of Love Actually and 28 Days Later, and the Freedom Fighter's old enemy Max Gamble returns as Tails & Amy hit the mean streets of the Casino Night Zone - but is Max the real enemy, or is there someone else behind the gang attacks on them? Sonic X-02 repeats on Jetix UK. Tues 2PM (ep53) and then 3 eps a day for the rest of the week. 9-10AM, 2-2:30PM. No word on the rest of the series but this is some good news at least. According to Diamond Comics, Archie's Sonic The Hedgehog #162 is on sale in comic shops since yesterday. You can see it at the video homepage. Plus new pictures of him in action. Players One-Four on Sonic the Hedgehog 06? Ooooooo. So, it was announced today at Microsoft's E3 conference that Sonic the Hedgehog (the Mega Drive one, I'd assume) is going to go onto the Xbox 360's Live Arcade service. Xbox Live Arcade, if you don't know what it is, is where you can download smallish games for a couple of quid on your 360, where they come replete with achievements and online leaderboards and so forth. I don't know what extra features will tie into StH though (apart from working in HD), or when it'll be released since there hasn't been a lot of detail on it. SAN FRANCISCO & LONDON (May 9, 2006) - SEGAÃ‚Â® of America, Inc. and SEGAÃ‚Â® Europe Ltd. today announced Sonic Wild Fire (working title) exclusively for the WiiÃ¢â€žÂ¢. Developed by SEGA Studios, Sonic Wild Fire stars the Blue dude with the 'tude on his first solo adventure since the original Sonic The HedgehogÃ¢â€žÂ¢ in 1991. This intense and exciting action game takes advantage of the innovative WiiÃ¢â€žÂ¢ controller as Sonic combines his trademark high-speed action with easy to play controls to offer a brand new experience! Sonic's new adventure unfolds from a storybook of the classic tale, Arabian Nights, the last several pages from the book have gone missing, and it's up to Sonic to re-create the story. The vibrant environments provide for a refreshingly new look to the franchise filled with brightly colored mosaic tiles, glistening oases, swaying palm trees, and crumbling stone columns. Sonic activates specific areas in the prismatic environment to pull off new tricks and stunts, in addition to interacting head-on with various obstacles by jumping, dodging, and dashing. "Sonic Wild Fire and the innovative Wii controller changes the way gamers play interactive entertainment," said Scott A. Steinberg, Vice President of SEGA of America, Inc. "SEGA is excited to lead the gameplay revolution through its support of Wii with a Sonic release built exclusively for this new system." 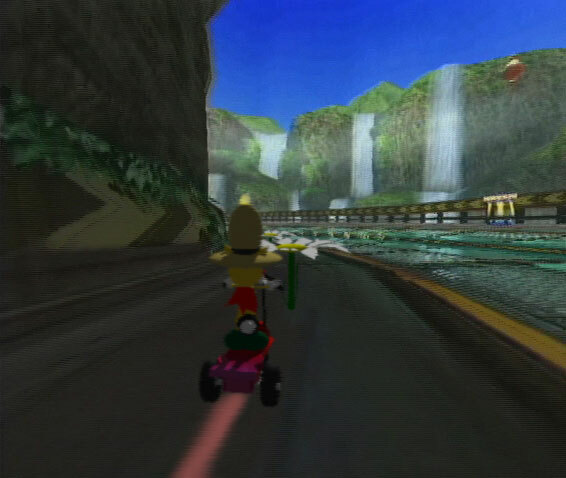 Gamers will use the Wii controller to steer Sonic and experience an untapped freedom in gameplay and control. Hold the controller horizontally with two hands and tilt left and right to steer Sonic on different paths and maneuver deftly from obstacles and enemies. Continue to tilt and fling forward to dash-attack ground and air enemies and to break down barriers. 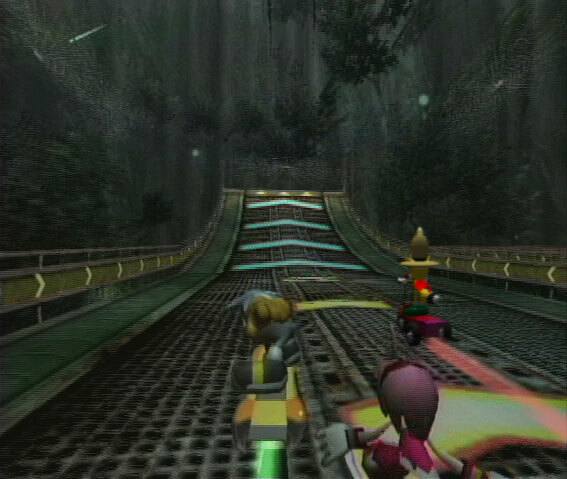 In addition to the main game is an array of unique controller-focused mini-games which make Sonic Wild Fire fun to play alone or as a multiplayer game with friends. Get ready for a refreshing adventure that puts you on the forefront of gaming! New next-gen Sonic The Hedgehog screens! Gamespot has uploaded 8 new screens from Sonic the Hedgehog for the Xbox 360 and PS3. They show Sonic fighting robots in a burning city and one in what looks like a church. It all looks a bit dark and Sonic looks pissed off in every shot! Still no signs of any other Sonic characters. According to Diamond Comics, Archie's Sonic X #8 is on sale in comic shops starting yesterday. I'm not sure what happened to Sonic Riders, but Sonic is getting an original title on the PSP entitled "Sonic Rivals". With single-player and wireless multiplayer modes, Sonic Rivals returns to classic 2D gameplay set in 3D environments. What starts as a friendly competition between Sonic and Knuckles quickly intensifies as Shadow and other rivals jump into the action, resulting in an all-out rodent battle royale. Players will negotiate wildly twisting 3D tracks while avoiding Dr. Eggman and his myriad of hazards, traps, and contraptions. You be the judge. Links below contains a little bit more info and some screenshots. Free Comic Book Day is on Saturday, May 6, 2006. If you are in Charlotte, North Carolina (or nearby), you will have the chance to meet Ian Flynn, the writer for Archie's Sonic The Hedgehog. Information, such as location and times, can be read here. If you are in (or near) Ithaca, New York, you will have the chance to meet Joe Edkin, the writer for Archie's Sonic X. The location can be found here. sonic x series 2, is being released in australia by MRA Entertainment. Starting with three volumes comeing out on the 12 of July 2006 each with three episodes each. That will chear you Australian sonic x fans up. According to Diamond Comics, Archie's Sonic The Hedgehog #161 is on sale in comic shops starting today. Ian Flynn posted the combined Sonic The Hedgehog #162-164 covers on his message board. "No Thanks for the Memories Part 2 of 2" Sonic's 15th anniversary adventure continues in Sonic X! Sonic, Amy Rose, Knuckles and Tails are trapped in a Virtual Reality universe powered by the Master Emerald. Now our Heroes must battle their way back to their friends who believe they have been left behind forever! Will Sonic be abandoned by his mistaken friends? Will Eggman win and destroy his hated nemesis? Will Bukkun's mad desire for sugary treats be the undoing of everything! SCRIPT: Joe Edkin. ART: Tracy Yardley. Virtually bombastic cover by Spaz! Ships 7/12. 32-page, full color comic, $2.25 US. "Leak": Its good cop, bad cop as larcenous Rouge The Bat, one of the most popular and deadly characters from the Sonic games and TV shows, seeks Sonic and the Freedom Fighters' help against a diabolical new group: The Destructix! It's a battle that will put Tails' life in mortal danger! Meanwhile, Rouge has her next item to steal, and you will never believe what it is! SCRIPT: Ian Flynn. ART: Tracy Yardley. PLUS: "Call of Duty": Another exciting new Knuckles back up tale-- featuring a decision that will change his life forever! SCRIPT: Ian Flynn. ART: Steven Butler. Demolition-time cover by Spaz! Ships 7/26. 32-page, full color comic, $2.25 US. According to Diamond Comics, Archie's Sonic X #7 is on sale in comic shops as of yesterday. Good way to start the new month, another decent update at Sonic's japanese hangout. It's way better now it's in html, IMO. Latest person added to the characters section was Super Sonic. I was longing for Metal Sonic myself (new non-CG artwork! ), but still, cool - finally some official Super Sonic art outside of the tiny icons in Shuffle. Something interesting that's also new is what appears to be a poll that asks about, presumably, your favourite and least favourite characters. There's a lot of chars there, including Fang, Bean, Bark, Mighty and even Ray. No Metal Knuckles or Tails Doll, though. I can only read katakana, which means I can only pick up the words 'character', 'comment' and the names of everyone included in the poll. It'd be good if we had someone good in japanese to translate so that the rest of us could participate. It might contribute to character inclusion/exclusion in the games, or it may affect the order of new character profiles on Sonic Channel (good good, for Metal and 'rare' characters). Anyone able to help or know someone else that could? Oh, some decent new artwork in the fanart section, as well. Due to popular fan demand, an exciting new mini-series will soon be hitting the shelves starring none other than the reinvented Evil Sonic, Scourge! Returning to his own dimension, Scourge finds that tensions have risen among the Anti Freedom Fighters, and now he's got to put together a new gang with a terrifying goal - to overthrow their world's benevolent Dr. Robotnik! Story lan Flynn, pencils Tracy Yardley. It's been discovered by members of the Mobius Forum that Dr. FexusFan is a secret character in Sonic Riders! FexusFan is an unlocked when you run over all 16 daisies in the game. They're hard to find and there's one in each level including Sega Carnival and Illusions. Once completed, Extra 5 is unlocked with missions where FexusFan is used. There are a couple of screenshots with FexusFan that can be seen below. Sonic Mega Collection Plus and Billy Hatcher and the Giant Egg for PC - but only in the UK? Sonic Mega Collection Plus and Billy Hatcher and the Giant Egg for the PC is being advertised as being released an the 31/3/06 on play.com and game.net two of the biggest online video game stores in the UK. But having looked on ebgames.com and gamestop.com it seems the game isnt set to be released in the US as of this time. According to Diamond Comics, Archie's Sonic The Hedgehog #160, featuring the debut of Ian Flynn, is on sale in comic shops starting today. According to Diamond Comics, Archie's Sonic X #6 is on sale in comic shops starting today. Comics Continuum has a 7 page preview of Sonic The Hedgehog #160, which will be released later this month and features the writing debut of Ian Flynn. Bean and Bark will make their first non-cameo debut and Blaze The Cat will make her debut in a back-up story. According to Diamond Comics, Archie's Sonic X #1-3 might be in some comic shops starting today. "Last month Newsarama ran the story about long time Sonic contributor Ken Penders leaving the title. To follow up on that Newsarama caught up with the new Sonic team of Ian Flynn, Tracy Yardley along with Sonic editor Mike Pellerito." MRA entertainment has released cover shots and release dates of the next batch of Sonic Underground DVDs in Oz, which will be 'released' on June 5th, vols. 4-6. If the last 'release' was anything to go by, don't expect to see them in stores. UnderGroundOnline posted a Sonic Retrospective chronicling Sonic from 1990 to 2006 in anticipation for the currently released Sonic Riders. Actually, I doubt it very much that I'm going to make it into the show at this point. I've come down with a stomach flu. On top of that, my mother was in a car accident and has been hospitalized. She'll be all right, but I can't see leaving town right now. I just wanted to let you know that Tim Smith III and I will be signing Sonic X comics at the Archie booth during the NY Comic Con. We're scheduled for Sunday, February 26, from 1:30 to 2:30pm. Editor Mike Pellerito will be around during the show as well. According to Diamond Comics, Archie's Sonic The Hedgehog #159 is on sale in comic shops starting today. ...will be on Wednesday, February 22, at 8:00PM EST / 5:00 PM PST. I'll try to balance the comments with answers to questions. to respond to more people as possible. Hope to see you there. Ok, I found this article which interviews Michael Haigney who edits the scripts for Sonic X and other animes as well. Now all it is meant for is to partially explain why somethings are edited/removed and is no way defending or condemning 4kids. Now with that out of the way: Discuss!! The waiting is over! The long-running Syndicate saga finally ends, as Super Sonic and Shadow fight to the death! And can Tekno find out why Shortfuse has been abducing innocents before it's too late? It's two strips for the price of none, and a gallery of exclusive Super Sonic wallpapers! Sonic Channel has some new updates on it's Sonic Riders page such as IG Productions, Course Overviews along with screens from cutscenes, Characters, and another Tokyo Show display. If you are planning on attending the NY Comic Con this month, there will be some Archie creatives at a panel on one of the convention days. "Darkest Storm Part 1 of 3": The first of three stories that will rock the world of Sonic to its core! Many of Sonic's worst enemies have been clawing their way out of the rogues gallery lately. Now, not one but two of the biggest villains in Sonic history, Mammoth Mogul and Ixis Naugus return to make Sonic and the Freedom Fighters' lives miserable! And the one to blame for all this is the mysterious nemesis known only as "Anonymous". Will the secret of Anonymous finally be revealed? SCRIPT: Ian Flynn. ART: James Fry. PLUS: A shocking back-up tale that will leave your brain bouncing! Tantalizing triptych cover by Spaz-collect all three issues for a complete image! "Darkest Storm Part 2 of 3": The action-packed, multi-issue epic warps into overdrive! Sonic not only squares off against some of his deadliest foes, the Magical Ixis Naugus and the Immortal Mammoth Mogul, but must also deal with an army of spider ninjas and the newest threat, The Destructix! Can even the combined strength of Sonic, the Freedom Fighters, Knuckles and the Chaotix be enough to save the day? And can another showdown with the ultimate evil, Dr. Robotnik be far away? SCRIPT: Ian Flynn. ART: James Fry. PLUS: Another sizzling Sonic back-up tale! Features the second in a set of triptych covers by Spaz-collect all three issues for a complete image! "Wicked Sweet Shuttle Shenanigans Part 2": Turning things up a few notches from the previous issue, Eggman ups the ante in his quest to pilfer the Thorndyke space shuttle by unleashing a gigantic spider robot at the World's Fair! Emerl continues to lurk in the background, begging the question, is Emerl friend of foe? An all-out battle ensues as Sonic, Knuckles, Tails, Rouge, Big the Cat and more give it their all to save the city! It's action and intrigue in the hit "Sonic X" animated series style! SCRIPT: Joe Edkin. ART: Tim Smith (pencils) and Al Milgrom (inks). Frantic thrills 'n chills cover by Spaz! According to Diamond Comics, Archie's Sonic X #5 is on sale in comic shops starting today. Ahead of the game's release later this year, IGN.com has released three tracks from the game's soundtrack for free download. It's worth noting that there is some deviance from the usual Crush 40 sound, with the tracks sounding more like something from Sega-developed F-Zero GX than previous Sonic 3D titles. Find the title theme and Sonic and Jet The Hawk's closing themes at IGN. A new awsome looking trailer has been added to the Sonic Riders website. Shadow of a Hedgehog recently published an interview with the band, A2, the group that made the Chosen One theme song for the Shadow the Hedgehog game. They talk about a song that Sega originally wanted to use for the game and lots more details about the band. For the full interview click here. On the FUS message board, their own Cheezmatt got into contact with Michael Tavera who, if you don't know, was the music composer for the first season of SatAM. Unselfishly and surprisingly, Mr. Tavera was willing to send Cheezmatt a CD of some of Season 1's music. Unfortunately there isn't that much background music available, but there are some unused themes and a short melody of background music that's totally worth the download. So a very big thanks goes out to these to for what I am about to present to you. I would also like to thank PorpoiseMuffins for the original hosting of the files. Presenting some of Season 1's soundtrack and unused tracks as well. Head on over to Fans United for SatAM to check out these great files. According to Diamond Comics, Archie's Sonic The Hedgehog #158 is on sale in comic shops starting today. The New Argos Caterloge is once again out and has some more interesting Sonic toys this season. Here is what is in stock now. Sonic Bendable Action Figures Pack: The small 3 inch big figures that include Sonic, Tails, Amy, Knuckles and 3 Chaos Emeralds. This pack comes free with a Eggman figure. They are priced as Ã‚Â£7.99 and are only Available at Argos Extra. Sonic Deluxe Figures: These characters featured are Sonic, Tails, Knuckles, Amy and Shadow, each one with it's own piece of robot when all collected makes a Megabot. Each figure costs Ã‚Â£7.99 and are only Available at Argos Extra. Sonic 5 inch figure with 2 Chaos Emeralds: At reduced price of Ã‚Â£3.99 and can be only bought on the Argos website. Sega Arcade Legends Volume 2: Once again this is back in Argos. This contains 6 Mega Drive games which are - Sonic the Hedgehog 2, Ecco the Dolphin, Columns, Alex Kidd and the Enchanted Castle, Gain Ground and The Ooze. The pack costs Ã‚Â£19.99 and is Available in all Argos stores. Sonic Mega Collection Plus - PS2: Ã‚Â£19.99 and is Available in all stores. Shadow the Hedgehog - PS2: Ã‚Â£19.99 and is Available in all stores. Sonic Heroes - PS2: Available as a triple pack with Spiderman2 and Shrek2 at Ã‚Â£34.97 (or free with a PS2 along with Extra controller and sterring wheel) and is Available in all stores. Sonic Heroes - GC: Available as a Twin Pack with Spiderman at a price of Ã‚Â£24.99 and is Only Available at Argos Extra stores. Sonic Heroes - Xbox: Available as a Twin Pack with the Simpson's Hit and Run for Ã‚Â£29.99 (or free when bought with a Xbox pack and a extra controller) and is Available in all Argos stores. Shadow the Hedgehog - Xbox: Ã‚Â£19.99 and is Available in all stores. Sonic Twin Pack - GBA: This pack contains Sonic Advance and Sonic Pinball Part at a price of Ã‚Â£29.99 and is only Available in Argos Extra stores. Sonic Rush - NDS: Ã‚Â£27.99 and is Available in all stores. That is all the Sonic stuff available in the Argos Caterloge and website. Check out it now. Sonic Underground back on television? CBS and DIC Entertainment (DIC) will partner to launch an all-new Saturday morning branded kids programming block to replace the current Nick Jr. block this fall....It will also feature successful series from DIC's extensive library of animated products including the Emmy Award-winning series Madeline and Where On Earth Is Carmen Sandiego?, as well as Sabrina: The Animated Series, Strawberry Shortcake, Trollz, Sherlock Holmes in the 22nd Century, Archie's Weird Mysteries, The Littles, Inspector Gadget's Field Trip, and Sonic Underground. Sonic X #8:Wickard Sweet Shuttle Shananigans: Ã¢â‚¬Å“Wicked Sweet Shuttle ShenanigansÃ¢â‚¬Â: A rousing adventure that takes Sonic and friends off to far away lands! The WorldÃ¢â‚¬â„¢s Fair in Paris hosts the unveiling of the New Thorndyke Industries space shuttle, and you donÃ¢â‚¬â„¢t think a little detail like that would escape the eye of Eggman, do you? Agent Topaz and Rouge are on the case, but when itÃ¢â‚¬â„¢s revealed that Emerl has been following them, will this mean disaster? Look out for Big the Cat and Froggy to finally make a big noise in the Sonic X comic as everything goes wild at the WorldÃ¢â‚¬â„¢s Fair! ItÃ¢â‚¬â„¢s more mystery, action and intrigue based on the hit cartoon series! SCRIPT: Joe Edkin. ART: Tim Smith (pencils) and Al Milgrom (inks). Globe-spanning cover by Spaz! Sonic the Hedgehog #161:Ã¢â‚¬Å“Birthday Bash - Part TwoÃ¢â‚¬Â: Continuing the chaos begun last issue, SonicÃ¢â‚¬â„¢s fifteenth anniversary yearÃ¢â‚¬Â¦ and his birthday partyÃ¢â‚¬Â¦ kick into hyperdrive! An attempt to steal the Master Emerald goes wrongÃ¢â‚¬Â¦ RougeÃ¢â‚¬â„¢s new accomplice Evil Sonic is transformed into a souped-up speed demon and renames himself ScourgeÃ¢â‚¬Â¦ and if all thatÃ¢â‚¬â„¢s not enough, things get even worse for Sonic as a long lost badnik from the early days comes back with a dangerous new twist! ItÃ¢â‚¬â„¢s a birthday full of Ã¢â‚¬Å“presentsÃ¢â‚¬Â Sonic would rather return! PLUS! : Another action-packed back up story featuring some of your favorite Sonic characters! SCRIPT: Ian Flynn. ART: Tracy Yardley. Crater-crunching cover by Spaz! New boards and a new trailer with even more peaks into the games cutscenes, check it out at the english Sonic Riders website. Sega Europe have put up a new poll on their homepage, asking us which Sonic character we'd like to star in their own game. The vote for Shadow may have influenced his game, so voting may be worth it. Swicherz has released a brand new line of Sonic X 3D stickers. These 3" characters are designed to stick on any flat surface including cars, motorcycles, boats, computers, surfboards and more. Check out all your favorites, Sonic, Amy, Shadow and Dr. Eggman. My older brother has informed me that the next line of McDonalds Happymeal toys in the UK will be a series of Sonic X toys. They are disk launchers in the shape of a characters head, and the disk shows an image of the character. The 4 characters will be Sonic, Tails, Knuckles and finally, Shadow. They are due out sometime this week or next week. I bring good news--and of course--BAD news. Ken Penders just lost his job for Sonic. I'm very serious. The english Sonic Riders website has updated its character section with characters such as Shadow, Cream, and A few new robot faces. A demo of Sonic running around a floating platform, complete with working HUD, enemies and traps a plenty, and MANY rings - oh, and the full Stardust Speedway BF (US), too. ...footage of... a playable Tiara?! More previews from Westfield comics. Sonic the Hedgehog #160-Birthday Bash: It's Sonic's birthday and we're presented with the newly refurbished, original Freedom Fighters base. Sonic X #7-Take this job and Shovel it: When city sewer workers unwittingly unleash Proto Shadow, Topaz and Rouge are assigned to investigate. Sonic Underground on ITV2 (UK) now! Sonic Underground is currently showing on ITV2 at 7:55am Mon-Fri. This is contary to what is being reported by Radiotimes.com who are listing it as starting on the 11th January. In fact it started showing on Jan 3rd. On the 12th day of Christmas, Sonic X is returning to CiTV. Don't get too excited though, its a repeat of episode 27. It appears they will show Sonic X every Thursday at 4:05pm. Hopefully this means they will finally show episodes 37-39 which they have but have not yet broadcast.